Network Fun!!! -- A Security/Network Engineer's Blog: SonicWall Firewall: "Packet dropped; connection limit for this source IP address has been reached"
SonicWall Firewall: "Packet dropped; connection limit for this source IP address has been reached"
You know, I get some settings in some of these firewalls. But sometimes, they can be annoying. I ran into an issue on a SonicWall firewall that was causing a few internal users to reload a webpage four to five times to actually see the page. You can image this being frustrating to the customer. As I looked in the log entries to try to figure out what was going on, I came across this error message: "Packet dropped; connection limit for this source IP address has been reached"
Well, that doesn't look good. 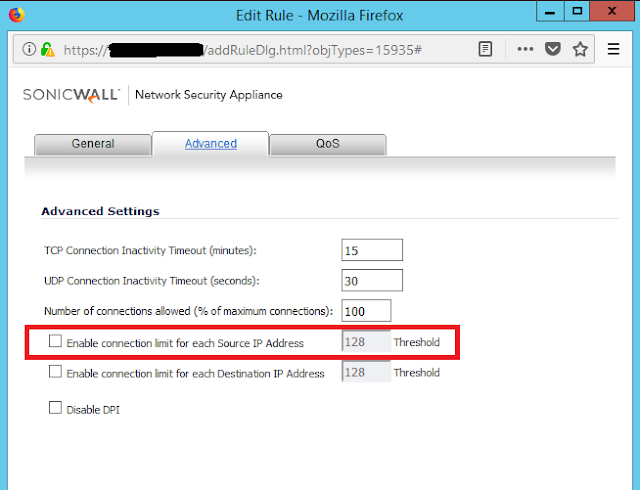 There happens to be a rule under Firewall --> Access Rules (LAN --> WAN rule), where by default, there is an enabled setting that will probably cause you this issue. So, I unchecked this setting, which again, is enabled by default. That should work for you if you are seeing this issue.